When best available price is more than one tick away from the limit price, the WAT order is repriced. If the best available price is one tick away and the available quantity drops below a specified threshold, the WAT order is repriced. Qty: The threshold is an absolute value. %: The threshold is a percentage of the WAT order quantity. For example, you could place a buy order and join the best bid with a WAT threshold of 100. When the best ask quantity drops below 100, the buy order price will be repriced one tick higher. 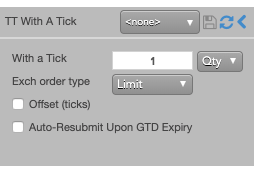 TT also allows you to add With A Tick behavior to all child orders of other TT Order Types, except for TT Trailing Limit. With a Tick: Sets the threshold to reprice the order. Auto-Resubmit Upon GTD Expiry: Valid only when the child order TIF is Day (GTD). If any child orders are not completely filled by the session close, the exchange will expire the child orders; when the market reopens, the parent order will then resubmit the child orders with the same parameters as when they expired.